Special Forces Group Soldiers Train For The Worst - USA Patriotism! When Capt. Andrew took his Green Beret combat dive team to Blythe for annual training during summer 2018, he had one priority in mind: save lives. Andrew knew his team’s ability to survive during waterborne infiltration missions overseas would increase with specialized swift water rescue training. He also knew the team’s Special Forces (SF) waterborne operations training and equipment could be a tremendous asset the next time a major hurricane or flood hits California, or anywhere in the world. All the team needed was a little more training and a little more gear. “As an SF team, we don't just go out there and hunt bad guys downrange, you know, we have capabilities that when we're homeland we can employ to help others,” he said, noting that the Florida and Mississippi National Guards both field full-time waterborne rescue and recovery teams with their dive-qualified SF soldiers. The Federal Emergency Management Agency (FEMA) maintains 28 Urban Search and Rescue task forces around the country, including eight in California. Waterborne rescue personnel and teams are included in each task force, and can be requested based on the needs of an incident. According to the California Governor’s Office of Emergency Services (CalOES), in the past two years, California deployed urban search teams, including water rescue elements, to help with response efforts for hurricanes Harvey and Irma in 2017 and again for hurricane’s Florence and Olivia in 2018. In January, the state called upon its water rescue elements to respond here at home when heavy rains triggered a deadly mudslide in the Santa Barbara County. Andrew’s goal is for his team is to integrate into a task force and be called the next time disaster strikes. In June, Andrew and his soldiers took to the water and took the first step toward becoming a fully certified and deployable waterborne disaster response team. For five days, instructors from Intrepid Maritime, a Rescue 3 International certified instruction company, put the team through its paces. “They’re recognized federally and internationally as the gold standard of validation and accreditation,” Andrew said. 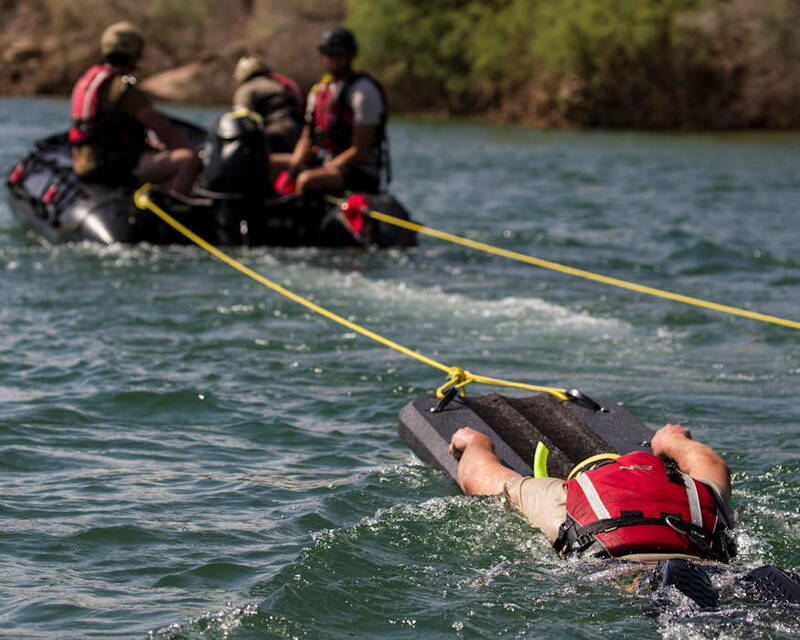 Using themselves as “live bait,” the soldiers worked to keep one another from being swept downstream using rescue boats, boards, float bags and ropes as they learned rescue techniques in fast-moving currents near the Palo Verde Dam on the Colorado River, which straddles California and Arizona. In one exercise, soldiers battled currents generated from the dam as they each swam across the river from one state to the other and then back again. Instructors infused hazard-recognition into each aspect of the training, giving Master Sgt. 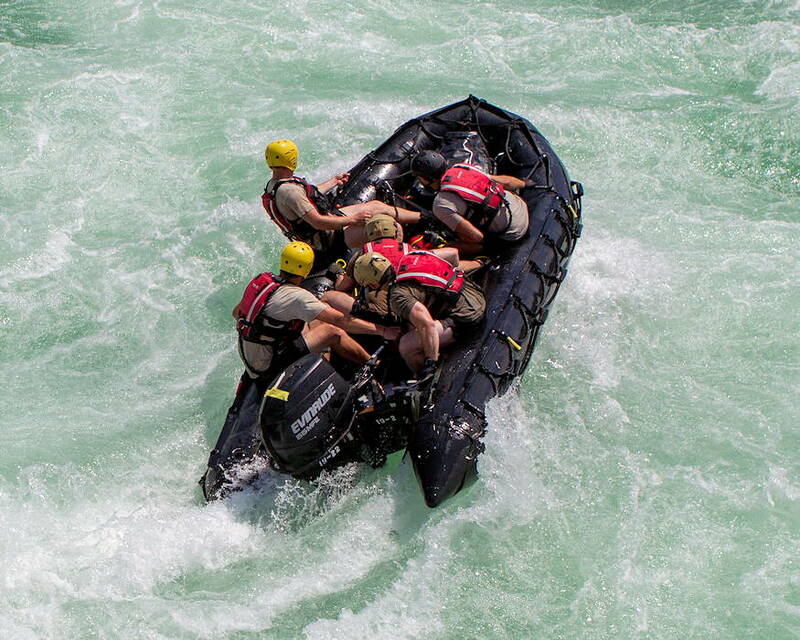 Alex, the team’s noncommissioned officer in charge, a new respect for river operations. “You don't know the hidden dangers of swift water, specifically to river-type rescues, and all the hidden dangers that lurk below the water’s surface,” Alex said. Conflicting currents caused by drop-offs from natural and man-made obstacles such as rocks and dams can be fatal, he said. Downed trees and debris also present a hazard to rescue teams. “That's where a lot of the technical components with rescues comes in,” he said. 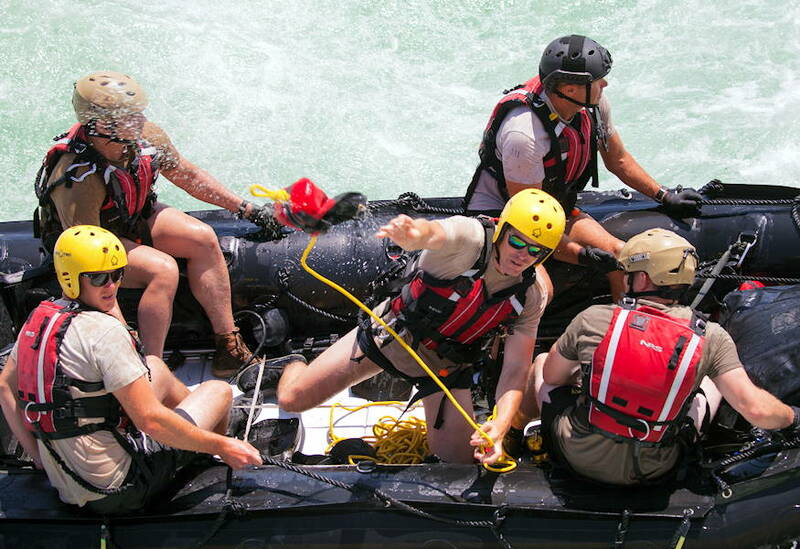 The team honed their rope skills in varying currents and depths before taking the gear onto their ‘Zodiac’-style boats. Once aboard, they conducted practice rescues at the base of the dam while battling the area’s strongest currents and most-dangerous waters. Their performance impressed Jeremiah Field, Intrepid Maritime’s lead instructor, who challenged the soldiers all week with different scenarios to prove their skills. Field, who has trained countless fire departments and other rescue teams on the water, said the soldiers stand out among his students. SF teams are perfectly positioned to perform disaster response work, Alex said. “We have a core group of guys, a small ‘A-team’ that are used to working with each other, self-reliant, won't quit and can really fight through adversity, especially in a time like a natural disaster,” he said. By week’s end, each soldier completed Swiftwater and Flood Rescue Technician Basic and Swiftwater and Flood Rescue Technician Advanced courses to receive certification at each skill level. Completing the individual certifications is the most difficult and critical component to becoming a deployable asset, Field said, noting that the team has a few more boxes to check before they can be requested by state emergency managers for activation as a standalone asset. “This is the first step to getting into the water side of urban search and rescue operations,” he said. The soldiers will each need classroom training in the Incident Command System (ICS) to integrate with state and federal task forces at a rescue site. The organizational system is the national foundation for emergency response work and incident management, and it ensures agencies can work together and speak the same language. Each soldier must also demonstrate land-based search and rescue skills to be officially recognized as a Swiftwater/Flood Search and Rescue Technician in the National Incident Management System (NIMS). NIMS is the doctrine maintained by the Federal Emergency Management Agency (FEMA) under which all nationwide emergency response assets are classified and called for activation. The assets, known as “resources” in NIMS speak, include personnel, equipment, and teams. 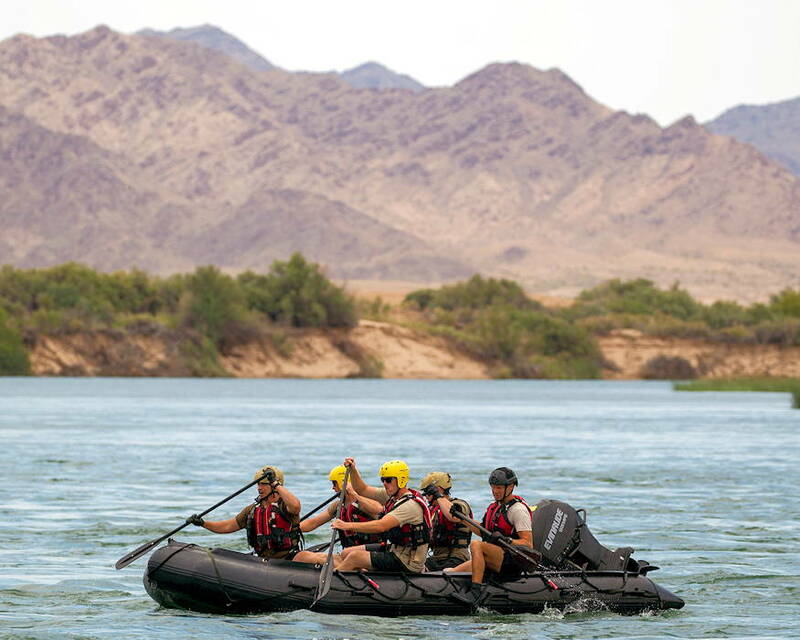 Some NIMS resources, such as a Swiftwater/Flood Search and Rescue Team, are also categorized and credentialed based on a team’s cumulative level of experience, member qualifications, specific capabilities and specific equipment requirements. According to the NIMS Resource Typing for Mass Search and Rescue Operations, Type 4 Swiftwater/Flood Search and Rescue Team credentialing requires three credentialed technicians, a team leader, a variety of maritime and rescue equipment, and a single boat. Type 4 teams can operate in still water or flood environments, perform first aid, cardiopulmonary resuscitation (CPR), basic water rescues, and request rope rescues and/or aviation assets, as needed. Type levels vary from 1 to 4, with Type 1 teams being credentialed to operate in the most complex situations. Teams move from still water to the more-difficult swift water with Type 3 credentialing, and can also operate around hazardous materials or contaminated environments. The number of personnel and minimum level of medical capabilities a team can provide increases at each credentialing level, as does the kind of rescues a team can perform. Type 1 teams can perform low angle rope rescues, use technical rope systems, and can perform as boat based support for helicopters conducting water operations. The equipment required for each type-level is effectively the same. A second boat and the people to operate it -- both of which the team already has -- is required to increase the team’s NIMS credentialing from a Type 4 resource to the highest level, Type 1. Between their boats, wetsuits, scuba gear and the other combat equipment they already have that can also be used for domestic operations, Andrew estimates that the team already has about $1 million in gear ready to use. The specific rescue equipment they need costs a fraction of that, around $75,000. “That includes live-bait life jackets, special rope rescue systems, dry-suits to protect from contaminants, floating rescue helmets, and propeller guards for driving their boats in areas with underwater debris,” Andrew said. Since the team could be called for a rescue anywhere anytime, access to a pair of enclosed trailers and four-wheel drive vehicles is also pertinent, he said, and will help get the team and its gear to a rescue site. NIMS requires a vehicle and trailer for each boat. Getting the gear and finishing out their ICS training are important, but small hurdles, compared with what the team is already capable of. “No other 12-person military element possesses the full-spectrum of capabilities that an ODA brings to the table,” he said. Andrew touts the team’s battalion-level command and control, intelligence and special security capabilities, infrastructure and engineering expertise, satellite communications, trauma and field medicine skills, and specialized infiltration skills by land, sea or air. “An SF ODA is unmatched in what it can bring to an isolated or austere emergency incident such as a flood or hurricane,” he said. For Andrew, the team commander, anything is possible. He envisions integrating the team’s swift water rescue skills with California National Guard helicopters and airplanes to help save people who are pinned by debris, trapped in vehicles or isolated from conventional emergency response efforts with water raging around them.